Opposition supporters marched to the Ramo Verde military prison just south of Caracas today in a show of solidarity with Leopoldo Lopez, the head of the Voluntad Popular party imprisoned in the facility since 2014. A previously-unreleased video showing the moments shortly after Juan Pablo Pernalete was wounded mortally at a protest in Altamira, Caracas this past Wednesday was posted on Instagram last night. The video shows Pernalete limping on a sidewalk aided by two other protesters. At the start of the video, freshly-fired tear gas canisters can be seen releasing their noxious contents into the air. The video end as Pernalete, unable to stand, collapses onto the ground. According to eye-witnesses, Pernalete was shot with a tear gas canister by a National Guard soldier on the left side of his chest at point-blank range. The impact caused fatal damage to his heart. PSUV vice-president Diosado Cabello said on Wednesday night just hours after Pernalete’s death that the eye-witnesses were lying, since–according to him–there were no National Guard soldiers in Altamira at the time of his death, so Pernalete could not have been killed by a tear gas canister. In Venezuela, tear gas is used exclusively by official state authorities. The National Assembly approved a roadmap for restoring democracy in Venezuela during a session held at an auditorium in Parque Miranda, Caracas. The roadmap continues seven points that parliament argues must be met for Venezuela to once again be a democratic nation. The conscience of whoever did this must be in ruins, because it turns out that they did not just kill a 20-year-old kid: they also killed his father, mother, girlfriend, and friends, all of whom will now carry this event with them. The appointment of an impartial Consejo Nacional Electoral [National Electoral Council, the body in charge of organizing and overseeing elections in the country]. That presidential elections be held, given Maduro leading role in the “rupture in the constitutional order” of the country. The scheduling of regional elections (for governors and mayors). The creation of a “humanitarian corridor” to allow nations to send aid in the form of food and medicine to Venezuela. That the President of the Republic and the Supreme Court respect the authority and autonomy of the National Assembly. That all of the political prisoners in the country (now in excess of 144) be released. That the regime demobilize its “paramilitary” groups (known in Venezuela as colectivos armados) and that it stop arming the National Bolivarian Militia. Those who are causing the people to suffer think that they can hang on to power. However, all of Venezuela is clear on this: the so-called “revolution” is in its death throes. Amnesty International released a report on Wednesday called “Venezuela: Silence by Force” in which it outlines some of the judicial mechanisms that the Maduro regime uses to persecute political opponents. The mechanisms include arbitrary detentions, false charges and even continuing to hold prisoners after judges have ordered their release. The document also contains a number of case studies outlining the lived experiences of several Venezuelans who have become victims of the Maduro regime’s legal arm for daring to speak out against the dictatorship. The widespread lack of independence of the judiciary in Venezuela and the frequent interference of the Executive and its agencies in its work, against a backdrop of deep political polarization, has given rise to an abusive and arbitrary use of criminal law as a mechanism by which to detain and prosecute people who hold opinions critical of the Venezuelan government’s policies. Amnesty International has been able to authoritatively observe the existence of numerous arbitrary actions when arresting and prosecuting dissidents, actions which are in violation of their rights to due process, freedom and personal integrity. The Consejo Nacional del Comercio y los Servicios [National Commerce and Services Council] (Consecomercio), a guild made up of the country’s business sectors, announced today that Venezuela has lost approximately 500,000 businesses over the last ten years as a result of the disastrous handling of the economy by Maduro and his predecessor, Hugo Chavez. The organization revealed that while there were 830,000 registered, operational businesses in 2002, that number is a mere 250,000 this year. 500,000 businesses have disappeared in ten years. In 2002 we had approximately 830,000 businesses operating in Venezuela, and today we’ve got fewer than 250,000. Colombia has 2 million companies, which poses a challenge to us. We have to see this as a sign of hope for Venezuela, to rebuild a million companies in the next ten years. That is the economic challenge before us. Riera stressed that Venezuela is arguably “the most complicated country in which to run a business”, since even registering a corporate entity requires at least 40 separate administrative processes. [The government] has total control over foreign currency due to their acquired monopoly (…) and they don’t give them out. It’s a stalemate. On top of that, we don’t produce, so the business owner finds that they have nothing to sell. 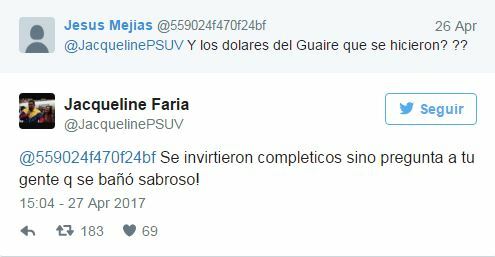 Jaqueline Faria, a high-ranking PSUV official who was once the head of the Capital District administrative region, mocked panicked protesters who jumped into the Guaire river on April 19 to escape clouds of tear gas fired by state authorities. Faria was at one point in charge of a project to revitalize the Guaire river, which has been a heavily-polluted waterway for decades. In 2014, national media reported that at least $14 million dollars given to Faria for the project “disappeared”, and the project never took shape. What happened to the money for the Guaire [revitalization]? They were all invested! Ask your people [the opposition supporters] who had a nice bath in there!